So a couple things have happened recently that have really made me more aware of the fact that one of the things I really do need to work on is being more assertive - and especially, more assertive in saying NO when no is, in fact, what I really want to say. I decided to do a reading for some advice/perspective on the topic. With no particular spread in mind, ended up drawing two sets of pairs that really summed things up for me quite nicely. 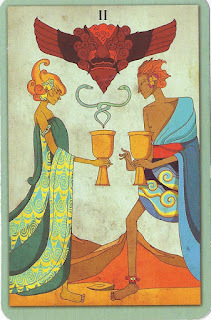 Here, in the first pair of cards - and notice the fact that they are both twos, which to me seems to intensify the message - is essentially the crux of the reason why doing this, why being assertive and saying no when that is what I am thinking, is so hard for me. I like harmony. I like to get along with people. I want people to have a positive impression of me, to be on good terms with me, to think well of me. Even when this is a bit silly - when the person in question is a stranger who I am unlikely to see again, or someone I know who has already violated my trust or our relationship in some way - I STILL don't want and don't like conflict. It just seems so much easier to go along, to keep everything smooth and nice, to keep up the illusion that we are on the same page, great partners in whatever it is, etc. 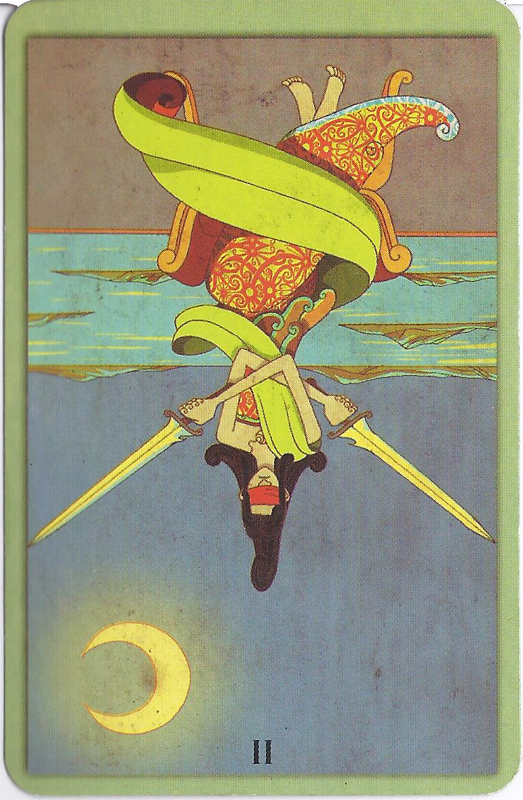 But of course that second two, the reversed swords card, is telling me that this is a balance that isn't really balanced at all. This is me taking on the weight of being unhappy, dissatisfied, feeling like I've lost something, etc., for no good reason. This isn't really a sustainable way of going about things. The ideal of getting along grand with everyone, in all situations, just isn't a realistic one. When I go into these specific kinds of interactions, with that idea of keeping EVERYONE happy, what I am really doing is making the other person happy and making me frustrated with myself. And well - if the fact is that one person is going to be dissatisfied anyway, why should it be me and not the person who was trying to take advantage of me or whatever? So yeah, this is an idea I really need to work on letting go of - in some circumstances, it really is ok not to be accommodating, even to be a bit 'rude'. Now here, in this second set, we have the 'solution' to my issue. 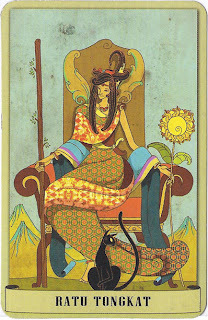 This queen of wands really projects confidence, doesn't she? 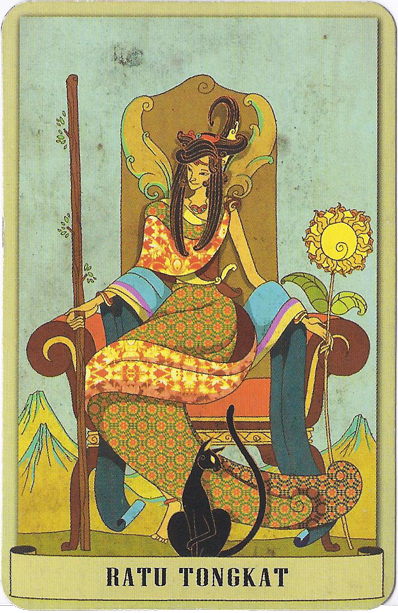 She sits perfectly comfortable in her throne, with that tall staff in one hand, the sunflower in the other. She has her tools, wields them with authority, knows how to do what needs to be done. A cat sits at her feet, which really compounds the message because - has there ever been a creature as self-assured as a cat? The message to be comfortable in my own skin, to be sure of myself, to trust intuition and my judgement and to not be afraid of externalizing that. Greater self-confidence would really help with this particular issue, I think. And if getting myself to feel that right away is a bit difficult? "Fake it till you make it" I believe the saying is? Indeed, let go of whatever mental things would try to hold me back and just do it, leap into it, do not be afraid, so worried of offending or bothering, particularly when I KNOW that the person I am dealing with has no such concerns of their own. 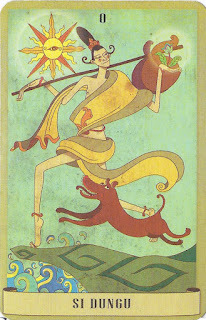 The sun in the fool card seems to be a reflection of the queen's sunflower and a stark constant to the moon in the 2 of swords - it has an eye, open, for knowledge, clear assessment of the situation, awareness, and its presence, like the Sun major, seems to speak of the potential for success. Just do it: No, I am sorry. No, I cannot. No, please leave. No, stop it. Just say it. Sometimes you really do just need to stop thinking and caring so much.